By serving up Alberta Beef from their very own farm, Modern Steak is a mouth-watering must-have. Located in the heart of Prince’s Island Park, River Cafe delivers elegant flavour with a touch of class. Blurring the line between adventurous and traditional, Anju serves up Korean food like no one else. The fun atmosphere and delicious food make Native Tongues the spot for anything and everything Mexican. With its ever-evolving menu and urban casual feel, travel the world by trying Pigeonhole’s Russian, French and traditionally Canadian dishes. Priding itself on top-notch ingredients, Shokunin offers a deliciously unique Japanese menu that surpasses expectations. 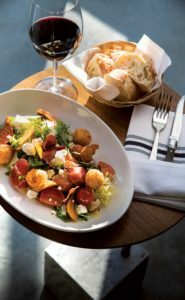 With great conversation and dynamic energy, Ten Foot Henry’s vegetable-forward menu is refreshing. With an open kitchen and fun atmosphere, it truly feels like you’re getting dinner and a show, which just so happens to be the poem the name references. This sultry, wood-fired bar is a great spot to enjoy bold flavours and fun dishes made by chefs who love what they do. Find yourself transported to the French countryside where you can try foreign delicacies in an approachable way. Vietnamese + Korean + French Canadian = Foreign Concept. This menu exudes Asian foods with a French twist. Italian family food with a stylish flare? Yes, please! Enjoy creative Canadian comfort food and a second-floor cocktail lounge at this joint. Serene and elegant, this restaurant offers a contemporary fine dining experience with organic, locally-sourced, seasonal ingredients. If mixing global flavours with local ingredients is the name of the game, they pull it off flawlessly. Pulling from its French heritage and Canadian roots, Rogue creates a semi-formal, posh dining experience. Modern yet traditional, Teatro’s recipes are based on its Italian roots, keeping the menu fresh with seasonal ingredients. Walking into The Nash is like walking into Old Calgary – upscale comfort food made from scratch. Located in an old house near the confluence of the Bow and Elbow River, Deane House uses local ingredients, including some vegetables from their riverside garden. Enjoying a little taste of Halifax, their small dining area offers an elegant experience with exceptional food. Well, what are you waiting for Calgary – book your reservations now!